Waterhead Cottage Self-cateringWaterhead Cottage is a delightful purpose built property with all the comforts of home. Set in a convenient location in-between Ambleside and Windermere in five acres of grounds, well screened from the road by a stone wall and large hedge it offers a good degree of privacy. This excellent location is rural enough to feel you are in the country, yet handy enough for both Ambleside and Windermere for shopping. The cottage boasts lakeshore access with private jetty for launching boats (mooring/launching at an additional cost), fishing or just simply enjoying the views. The local bus stop and water taxi (at the neighbouring Lake District Visitors Centre) are a few hundred yards away, with restaurant and adventure trail within easy walking distance, so use of a car is not essential to explore the surrounding area. 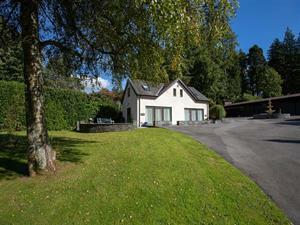 Waterhead Cottage is next door to Lakeside Cottage (Property Ref. No. 1171) and whilst each property has its own private patio they share the rest of the grounds. This would be an ideal location for two couples wishing to stay together whilst retaining their privacy. Accommodation: Waterhead Cottage has been equipped with high quality furnishings, decor and appliances, and great thought has been taken to provide everything you would need for a relaxing stay - a home from home! The entrance opens in to a spacious and welcoming open plan lounge/dining room (with flat screen HDTV with ipod dock and surround sound, DVD player, and hi-fi with CD player) and fitted kitchen which is flooded with light from the full length feature window to the front of the property and French doors to the side, which open onto the furnished patio area. Stairs lead to the large double bedroom, which has sloping rooflines, velux windows and fitted wardrobes - king-size bed (or twin) and additional colour TV and views to Lake Windermere and beyond. Modern en-suite bathroom with bath with shower over, wc and basin. The cottage is tastefully decorated with lots of attention to quality and detail and fitted carpets throughout, with gas central heating and hot water. Free Wi-Fi broadband. A welcome pack is also provided on arrival. Outside: Set in five acres of grounds, which is shared with the separate detached owners residence, you can stroll down to the water's edge for quiet drinks or to catch a lake cruise (there is also a gas BBQ and picnic table), or use its own private patio area adjacent to the property with chimnea, garden furniture and gas BBQ. There is also outside storage for bikes. Nearest shop and pub just over half a mile. Note: Private lake access for launching dinghy (mooring £35 per week) and fishing by prior arrangement. Sorry no cot or high chair available. Lowwood Leisure club walking distance. Private jetty for launching boats/fishing. Lake District Visitors centre walking distance. Children welcome from any age. Waterhead Cottage offers weekly bookings starting on Saturday. Waterhead Cotta offers weekly bookings starting on Saturday.